Published: Nov. 6, 2016 at 05:47 p.m. Published: Sept. 27, 2015 at 03:41 p.m. 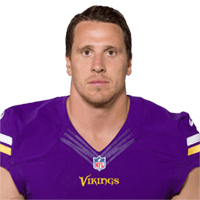 Published: Aug. 23, 2014 at 11:15 p.m.
Minnesota Vikings linebacker Chad Greenway picks off a pass from Kansas City Chiefs quarterback Alex Smith. Published: Dec. 16, 2013 at 04:38 a.m.